"Some of the bestselling herbs for spring may surprise gardeners," says Briscoe White, head farmer of The Growers Exchange. "Stevia, rue and comfrey are ranking near the top. Each year the best sellers vary," he explains. "A TV chef only needs to mention Stevia and all of a sudden everyone wants to grow it in their garden." So what makes you plant a particular herb? Is it because you read about it or heard somewhere such as the case with Stevia that it is “the fastest growing all-natural sweetener. It is 300 times sweeter than processed sugar and has little to no calories, and according to White, it's easy to grow in your garden. "Stevia may be healthier for diabetics because it does not raise blood glucose levels." He adds, "The leaves themselves are incredibly sweet, it's like herbal candy." P.S. 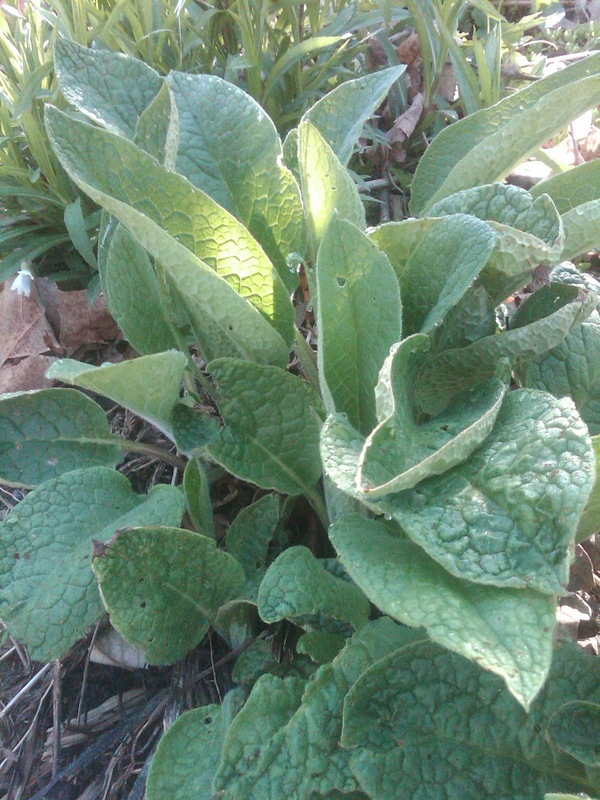 This is what the Comfrey looks like in our garden this morning but this plant takes up a lot of real estate so give it some room to grow. It also sports a pretty flower but it can become a bit shaggy; best to trim it back often. Thank you for mentioning National Garden Bureau and the "Year of the Herbs."